Dhaka, 11 September, Abnews: The Executive Committee of the National Economic Council (ECNEC) today approved the selected madrasha development project with an estimated cost of Taka 5,918.63 crore in a bid to ensure infrastructural development of some 2,000 selected madrashas in the country. 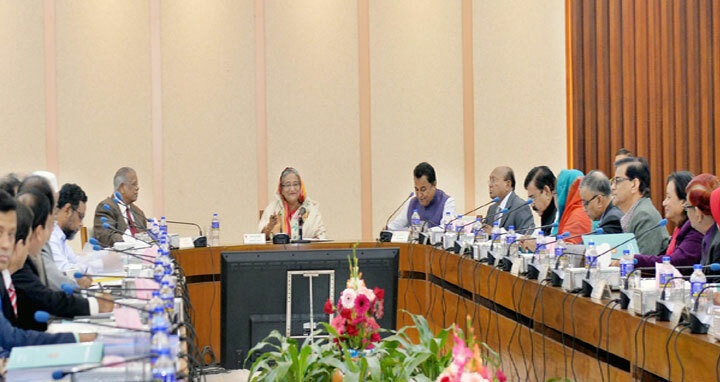 The approval came from the sixth ECNEC meeting of the current fiscal year (FY19) held at the National Economic Council (NEC) conference room in the city’s Sher-e-Bangla Nagar area with ECNEC Chairperson and Prime Minister Sheikh Hasina in the chair. Briefing the reporters after the meeting, Planning Minister AHM Mustafa Kamal said a total of 18 projects were approved today involving an overall estimated cost of Taka 17,786.95 crore. Of the approved 18 projects, 12 are new and six are revised projects. The Madrasah Development Project operations include construction of madsrasha buildings, classrooms, upward extension of madrasha buildings, construction of new madrasha buildings in divisional and metropolitan areas, hilly areas, coastal areas, haor, baor, beel and river prone areas, salinity prone areas and procurement of necessary furniture. Answering to a question, AHM Mustafa Kamal, commonly known as Lotus Kamal, said a project related to the use of Electronic Voting Machine (EVM) is likely to be placed in the next ECNEC meeting. The use of EVMs might be on trial-run basis in the next general election, but the matter is up to the Election Commission, he informed. The other projects approved in the meeting are Rural Transport Improvement Project-2 (RTIP-2), second revised, with Taka 4,819.70 crore, Completing the unfinished works of PC Girder Bridge on Lohalia River under Patuakhali district with Taka 102 crore, Embankment protection and dredging of Arialkhan River under Faridpur district with Taka 291.49 crore, Noakhali, Feni, Laxmipur, Chattogram and Chandpur agriculture development project with Taka 69.43 crore, Power distribution system development, Chattogram Zone, first revised with Taka 1,421.48 crore, Extension and strengthening of Bangladesh Standards and Testing Institution (fifth district), third revised with Taka 51.45 crore, Development of Pabna Science and Technology University with Taka 480.60 crore, Integration, modernization, maintenance and extension of safety facility of 3MW capacity research reactor facility of nuclear research institution in Savar with Taka 74.95 crore. The rest of the approved projects are Urban primary health care services delivery project (second phase) with Taka 1,136 crore, Physical Infrastructure development of eight pourasabhas under Jamalpur district with Taka 612.86 crore, Land acquisition for surface water treatment plant of Rajshahi WASA with Taka 78.69 crore, Preservation of history and historical building and surroundings development of Dhaka Old Central Jail with Taka 607.36 crore, Preservation of killing field and construction of monument for the mass killing committed by the Pakistani occupation forces during the War of Liberation in 1971 with Taka 442.40 crore, Pachuria-Faridpur-Bhanga Railway Track rehabilitation and construction, second revised with Taka 347.31 crore, Jamalpur-Dhanua-Kamalpur-Roumari-Datbhanga district highway widening and strengthening (Z-4606) (Kurigram portion) with Taka 332.10 crore, Strengthening of first class weather surveillance station at 13 river ports in Bangladesh with Taka 80.50 crore and Barisal Division rural Infrastructure Development with Taka 920 crore.